They say good things come to those who wait. Well, maybe not "good" things, but certainly "things." "Things come to those who wait." Swamp Things. Swamp Things come to those who wait. Doused in burning chemicals, the dying Alec Holland fell into the swamp. His spirit rose as a mass of plant life in the shape of a giant man. Now an Earth Elemental, the Swamp Thing protects the entire planet. Swamp thing was a figure fans had been asking about for years, and the Four Horsemen always said they'd love to do him - but since he was technically a Vertigo character, not DC Universe, he was off-limits. But DC gives Mattel a heads-up on upcoming stories, which is why it was literally the day after Swampy rejoined the DCU in Brightest Day #24 that Mattel announced him as this year's SDCC exclusive. The first thing we must discuss is the height. The figure is nearly 9½" tall, which makes him bigger than most of the DCUC Build-A-Figures! 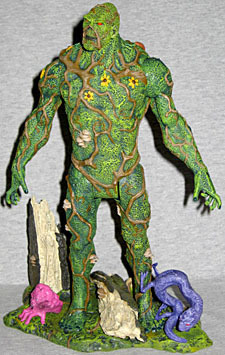 Now granted, Swamp Thing is a being composed entirely of plant material, so there's no limit to what size he can be: he travels the world by growing a new body and dumping his consciousness into it wherever he wants to go, and it's never even been hinted that his new body needs to stop growing at 7'5" or anything. So yes, being two inches taller in toy form is perfectly fine - but it still doesn't make any sense. He's interacting with human-sized people, so why would he make himself three feet taller than them? Inferiority complex? Seems more like bad planning on Mattel's part. There's long been a rumor that the Four Horsemen had a Swamp Thing sculpted several years ago and have just been waiting for the chance to release him - the same thing that happened with MotU - but that's not true. This is a new sculpt, finished last November. Judging by the bullet-shaped head and the big jug ears, this is the classic Bernie Wrightson version of Swamp Thing, rather than a more modern interpretation. Since the figure is so large, there's a lot of surface to cover, and a lot of room to admire the details of the sculpt. Nearly every inch of this mighty monster is covered with a spongy texture, as though his skin were made of moss. Every so often, a tendril or vine will poke through the surface, snake its way across the body, then disappear again. 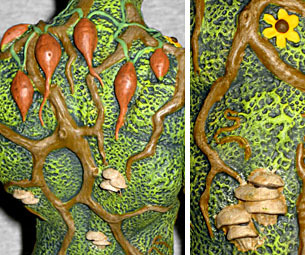 Obviously there are thick brown roots all over, prodiving the firm framework to support the rest of the plants that comprise his body, but he's also adorned with five yellow flowers, various mushrooms and other fungi, and even six of the strange psychedelic hallucinogen yams that sprout from his body. He does still have a few hints of human anatomy: finger and toe nails, lips, a belly button, but no twig and berries. Swamp Thing's articulation is... unusual. He doesn't move like a normal DCUC figure. At a glance, he only moves at the big five: neck, shoulders and hips. Those are the only joints visible. See, in order to preserve the sculpt, most of the joints are accomplished via an internal armature, while the figure is covered by a rubber skin. It's the same kind of articulation Mattel's been giving Barbie for years, so you have to figure they know what they're doing. The ankles, knees, wrists, elbows and torso all have ratcheted hinge joints that click between positions, to keep the rubber from pushing the joints back to neutral. There are at least three "clicks" worth of motion in all the joints, which doesn't make for a huge range of motion, but is better than being solid, right? The head is a balljoint, while the shoulders and hips are swivel/hinge. There have been plenty of figures before with flexible rubber skin, and a common problem with them is that their rubber dries out and cracked, falling apart when you flex it. Will that happen with Swamp Thing? Truth is there's absolutely no way for us to know. Some people are pulling Swampy out of the package and finding he's covered in a slimy goo - after they wiped it off, he started cracking. Others have reported cracks forming as they flex him, or white stress marks appearing if they leave his joints bent for a few days. All I can tell you is this: my Swamp Thing was not particularly slimy when I took him out of the package, and after playing with him all day while writing this review, I haven't spotted a single noteworthy flaw in his skin. Yet. If the situation changes, I'll update the review, but look at it this way: there are Barbies from the early '70s whose knees still work just fine; are you really going to be harder on your toy than a little girl is on hers? If you bought Swamp Thing at SDCC, you got two extra pack-ins: the Un-Men Ophidian and Cranius. The Un-Men are the horrible creations of Dr. Anton Arcane, stitched together from spare cadaver parts and brought to life by magic. Cranius and Ophidian are the only two Un-Men named in the creatures' first appearance (Swamp Thing #2), which is probably why they were chosen to get toys. Cranius, the leader of the Un-Men, is a malformed head attached to the back of a hand; Ophidian is eel-like and has hypnotic powers. The colors do not come from the comic - Cranius was a pale grayish lavender, not hot pink, and Ophidian was yellow, not purple. Of course, he also had 10 pairs of legs, not two, so clearly some liberties have been taken. The way Ophidian is sculpted, he can latch onto Swamp Thing's arms, and you can perch Cranius on his shoulders. These guys are neat, but in the grand scheme of things, they're more suitcase and comics than Gleek, if you catch our meaning. 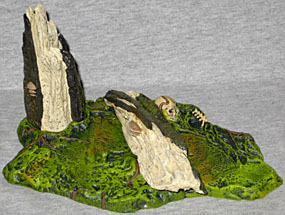 Whether you bought Swamp Thing at the show or on Mattel's website, he includes a fancy display base. It's a section of swamp, measuring about 6½" by 4¼", and there's a broken tree jutting 3¾" tall. The base is nearly as detailed as Swamp Thing himself, and has a footpeg to help keep him standing. You'll notice a small human skeleton at the back of the base - it looks to be closer to a 5" scale than DCUC's six inches, but that doesn't mean you can't pretend it's Alec Holland's corpse anyway. Even the packaging for Swamp Thing is cool. We begin with a big green box, decorated with thin, tightly spaced bayou trees. The front of the box is die-cut, allowing us to see... something watching us from within. 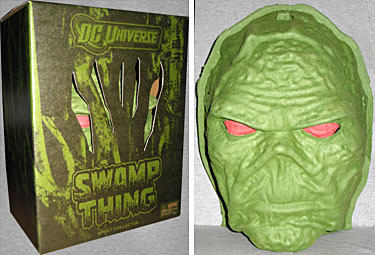 Open the box and you'll find Swamp Thing's head. No, seriously: the inner packaging is molded in the form of his head, complete with his scary red eyes. It's made from recycled paper pulp, which means it's completely biodegradable. The packaging can either double as a lifesize bust, or you can wear it as a mask. Versatility! We'll warn you though, put the packaging face down before you open it, or the figure will fall out. Oh, the box also contains a replica of Alec Holland's journal, burned beyond use. Taken by himself, Swamp Thing is a pretty good figure. He has a good sculpt, interesting articulation, an innovative design and really cool packaging. But the fact is, almost no one who's going to buy Swamp Thing is going to be juding him by himself. He's technically a part of the DC Universe Classics line, and by their standards, he's grossly oversized and mildly underarticulated, and there's no guarantee he won't disintegrate in your hands in a year or two. 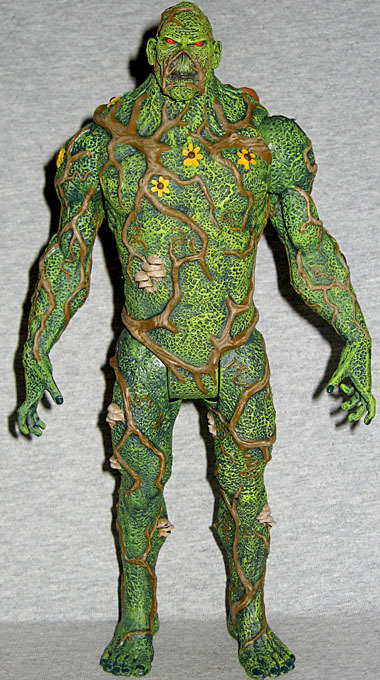 We applaud Mattel for trying something so vastly different, but it's the same problem that Masters of the Universe Classics had: by not fitting in with any other toys, Swamp Thing undercuts his own value. 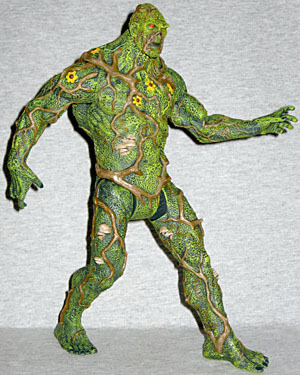 There's nothing wrong with this figure, as long as what you're looking for is a really cool Swamp Thing collectible. 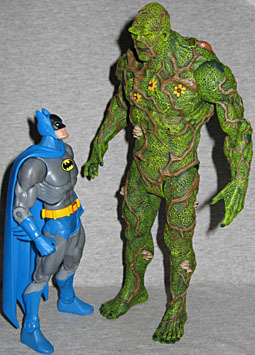 But if what you want is a green plant-man to put in a display with your DCUC figures, you'll be better off with DC Direct's version; at least until Mattel takes a second shot at him.